Volunteer – Help us get 200,000 books on Sunday! 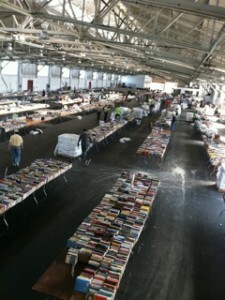 We have a windfall: the Friends of the San Francisco Public Library are offering all the unsold books from their yearly book sale to the Internet Archive if we can pack them up. The Archive will then move them to our Physical Archive in Richmond, California, scan the ones we do not have already, and ready them for physical preservation. The duplicates will be donated to a charity that helps direct books to those in need. We will have snacks and refreshments, music, and mementos for all volunteers! Come help us accept the generous donation of approximately 200,000 books from the Friends of the San Francisco Public Library. You can arrive at any time between 4 pm and midnight, but the earlier the better! Fort Mason Festival Pavilion is located behind building E. There is pay parking in the Fort Mason lot, or park outside of Fort Mason for free. There will be no heavy lifting! Just book sorting and fun for everyone! If you are also available to help on Monday and Tuesday (9/26-27), we will be there from 7:30 AM – Midnight both days and would love your assistance! It will be fun and productive. And you will be helping to build a library! PLEASE RSVP on the Facebook event page, or by emailing ginger at archive dot org. This entry was posted in Books Archive, News. Bookmark the permalink. 2 Responses to Volunteer – Help us get 200,000 books on Sunday! I help to run a community service program at our high school (San Francisco Waldorf High School in West Portal). Would you be open to having high school students help out too (ages 15-18) with this project? If so, I will spread the word. Please reply today if possible as I have a Weekly Announcement to send out this afternoon and I could include this… Thanks!